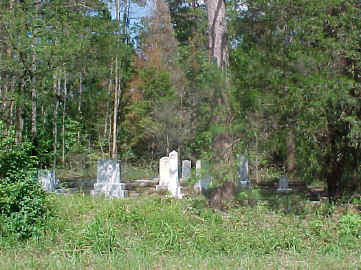 Perkins-Evans Cemetery is located on Co. Rd. 79, in the White Oak Station Community. It is just less than a mile north of the RR tracks, on the right side of the road. This cemetery is beginning to feel the pains of abandonment. This survey was completed on 22 April 2000, by Richard Price. There are at least eighteen unmarked graves in this cemetery, one that is marked but is completely illegible and one that is marked with a pile of stones.